One bike. 30 seats. 20 minutes. 2kms. One great team working to create more survivors! 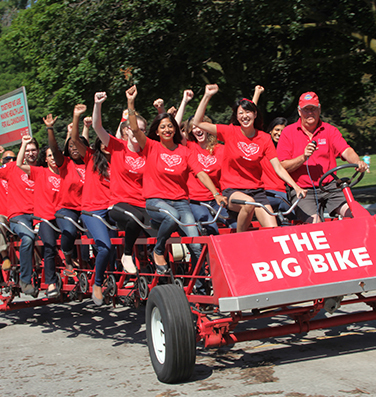 The Heart&Stroke Big Bike is a team event geared towards companies, community organizations and groups. Teams are made up of 29 enthusiastic riders who each commit to raise $50 or more to support heart disease and stroke research. On event day, one of our drivers will accompany you as you pedal through your community and celebrate your accomplishments! Click on Join a Team or Start a Team above and register now to join us for the Heart&Stroke Big Bike! It’ll be the biggest and best ride of your life! Why Join the Heart&Stroke Big Bike? You get to ride a bicycle built for 30! And you’ll help more heart disease and stroke survivors go home to the people they love. Now that’s something to get excited about! Just imagine how you’ll feel when you ride the Big Bike…laughing, smiling, and celebrating! That’s what you’ll help give back to people who are touched by heart disease and stroke by fundraising at least $50. Together, we’ll create more survivors. See what the money you raise can do! Last year over 70,000 riders, in over 200 communities coast to coast, helped raise over $8 million for research! This is helping us change the lives of not only heart disease and stroke patients, but all Canadians. We know you’re fundraising to ride the Big Bike and help create more survivors…but it’s nice to get a little something in return! See the prizes here. Win even more when your team becomes a Big Bike VIP team!